One of our 400+ laying hens has gone broody. Night and day she is on a nest of eggs. 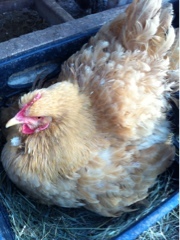 We pull them out from under her but she waits for the other gals to put eggs in the nest and then *bam, she is on them. There are a couple of roosters on the farm. Not on purpose, but here non the less. We can combine a rooster with a small flock that includes this girl and provide her a nest of eggs that would hatch and be chicks. One rooster is a Cuckoo Maran. That variety of chicken lays an egg that is a rich, very dark brown in color. He gets my vote, as I love a box of eggs with a wide assortment of colors! And we still have a few Maran hens, together we will have lovely chicks! We also have a small incubator. It holds about 2 dozen eggs, has a reservoir for water (so eggs stay moist, a must for egg hatching) and an automatic turner. Not the same as being in the nest under a hen, but it help us produce twice as many chicks. Might be time to fill it and a best for this gal too. This hen is a brahma. She is a good sized gal with feathers all down her legs, pleasant and quiet. Good traits for a momma hen. And focused. 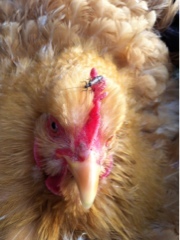 Even the bug could not make her move from the nest!